As many of you know Monkey has just started school and is learning so much so quickly. I am a very proud Mummy, one of the things which he keeps asking about is telling the time. 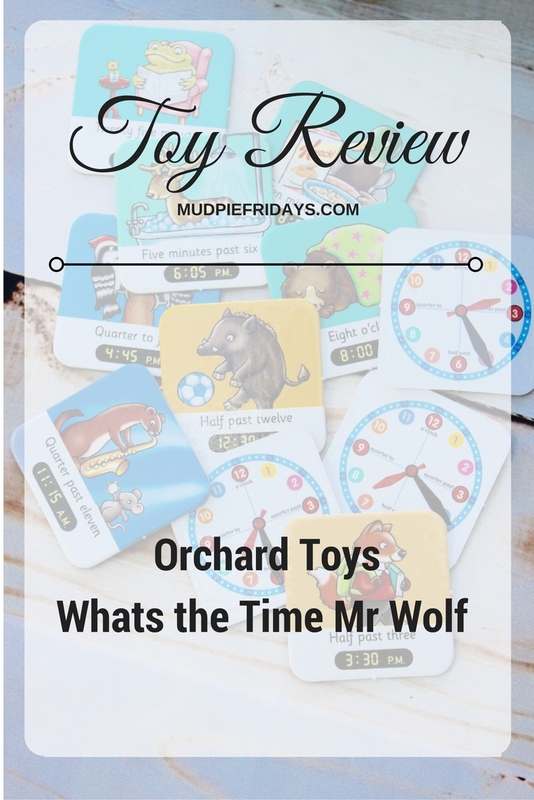 He has been fascinated by a couple of books we have all about time, so when we were offered the opportunity to review Whats the time Mr Wolf by Orchard Toys I jumped at the chance. Especially as it took me right back to my childhood when I use to play the game myself in the local park. So how did we get on? Age – 5-9 so at 4.5 Monkey is at the young end of the range but had not problems playing the game. For younger children the aim is to be the first to fill your collection board by moving the hands on the large clock face to show the time on the square playing cards. As you move around the playing board you need to be careful not to land on a wolf which could mean you loosing a card off of your collection board. For older players the aim is to be the first to fill your collection board by matching the written or digital times on the animal cards to the times shown on clock faces on the collection board. This is done by taking it in turns to turn the square playing cards over and seeing which board has the correct clock face. 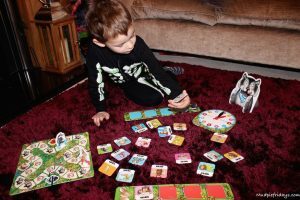 Skills – Apart from the obvious skill of helping children to learn to tell the time and number recognition, the game also teaches turn taking, observation skills and encourages discussion. Monkey and I had some very interesting conversations around what the little animals were doing on the playing cards in addition to telling the time. Monkey has also been focusing on counting at school so this game is ideal for this as each player takes a turn with the dice and needs to count spaces on the game board. As Monkey is only just learning to tell the time we played the game for the younger children. 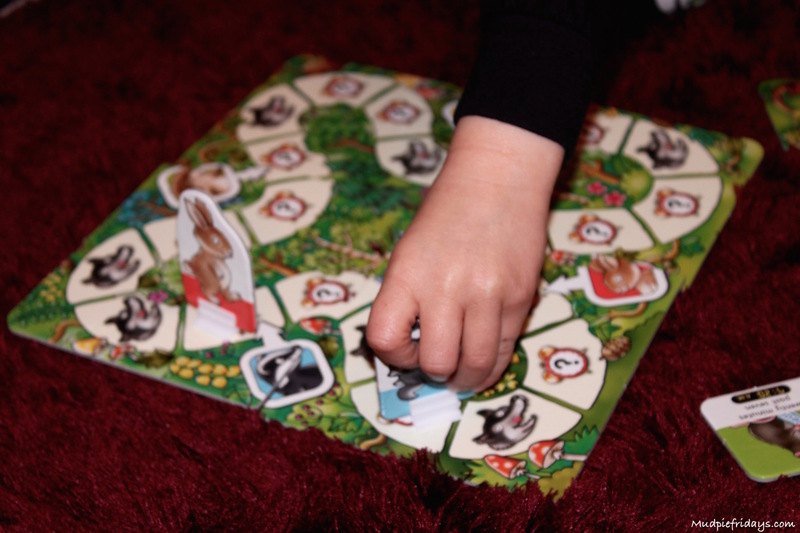 Although there are a lot of parts its quite a simple game, first you lay down all the square cards with the cute animals facing upwards. You take it in turns to move around the board if you land on a clock then you can pick up a card. 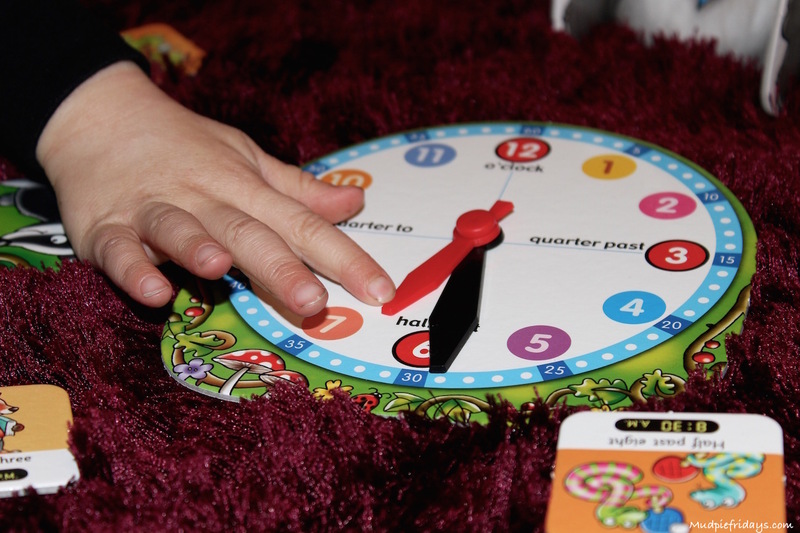 Each card has a time on in which you read out and then need to move the hands on the large clock to the correct time. On the back of the square cards there is a analogue clock picture showing where then hands should be to allow the player to compare and see if they got it right. If you land on a wolf you loose a card. He couldn’t wait to get started. Its easy to play and move around the board. 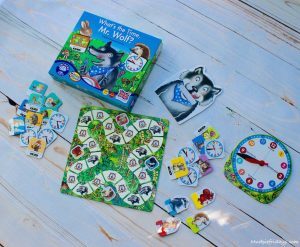 Due to its nature its a reasonably quick game to play unless you get a real run of bad luck and end up landing on a number of wolves! Monkey loved shouting out ‘whats the time Mr Wolf’ and giggling when I had to give up my playing pieces for the wolf’s lunch! 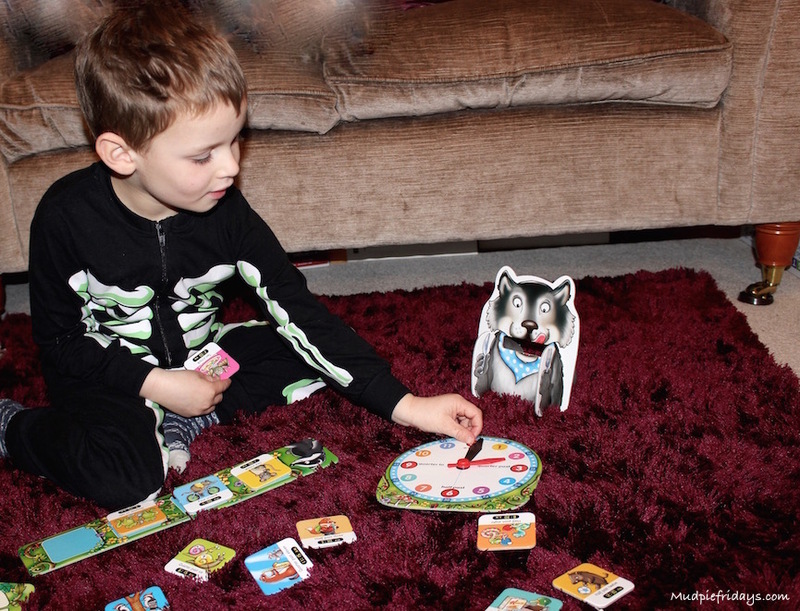 He is very competitive which is why games such as this are a great way for him to learn as he can’t help himself! I was surprised that the found it quite straight forward being able to move the majority of the times on the clock. The clock face has different colour minute and hour hands which means it is easy for him to distinguish between the two. There are also a blue line around the outside of the clock which shows the number of minutes such as 15, 30 and 45. 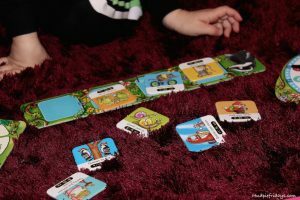 We can’t comment on the game for the older children as we are not there yet, but what I can say is that the first game is ideal for children who have just started school. That the game has longevity and we can play a different version of it as he learns first how to tell the time and then how to read a digital clock. It is the usual high quality I have come to expect from Orchard Toys, the illustrations are bright and detailed, the card thick and sturdy. The price, at a very reasonable RRP of £9.50 its ideal as a Christmas or Birthday present for one of Monkey’s friends. 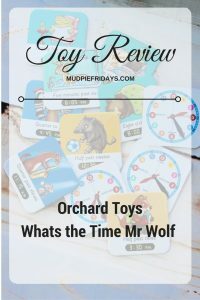 Have you tried Orchard Toys? If so whats your favourite game there really are so many fantastic ones. We’re learning to tell the time here too. 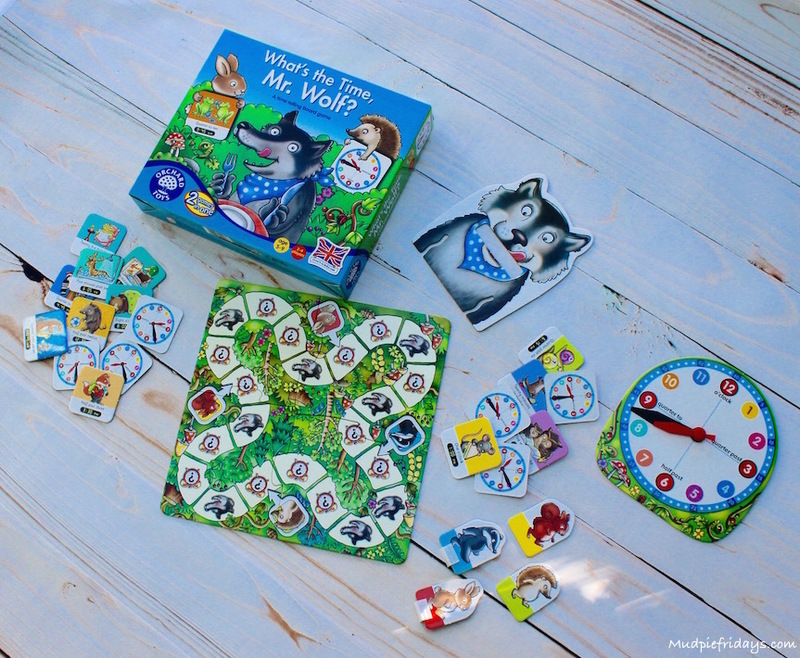 This may be a good game for Christmas, I love the wolf! !